Meade Mc Cloughan organised this fourth inspection ride which took place on Saturday 15th October 2011. He was accompanied by Vivian Gambling, Alexandre Santacreu, George Coulouris and Jean Dollimore. Draft report. Click here to see a map of the area in a new window. 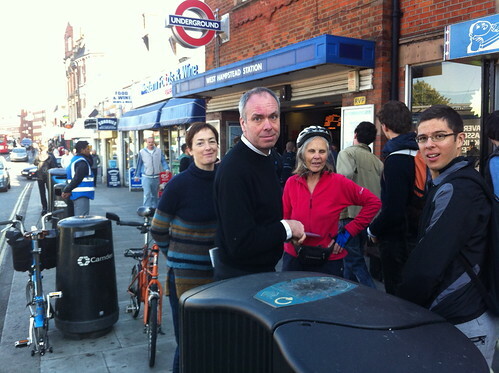 The group of inspectors met outside West Hampstead Tube Station. 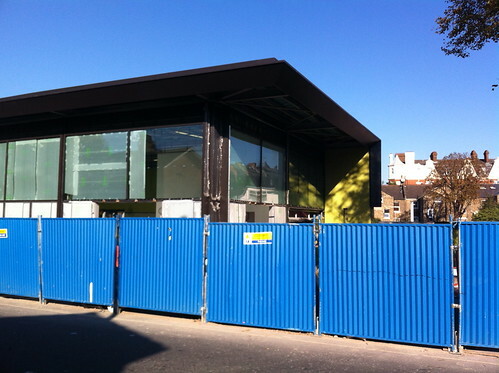 After observing the congestion and lack of space for cyclists, we moved to the new entrance to West Hampstead Thameslink station in Iverson Road. 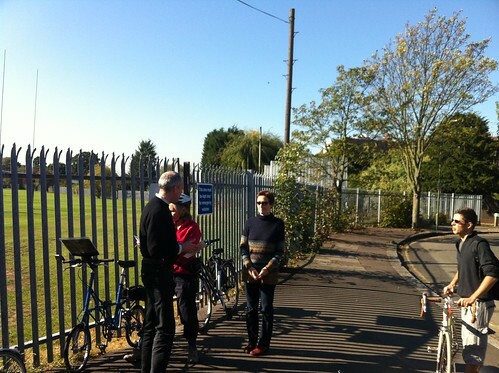 Sumatra Road: We rode along Sumatra Road which runs from West End Lane to Mill Lane. 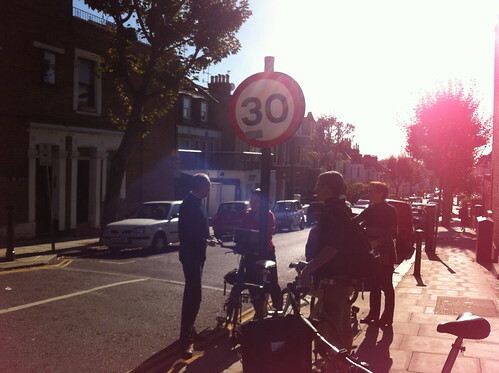 It’s clear that this residential road is a rat run – Alex suggested that it should be stopped at the midpoint by a movable bollard. Although there was a current consultation concerning Sumatra Road which offered only some traffic calming, it offered nothing to reduce traffic through the road. On reaching Mill Lane we were sad to see that the residential Sumatra Road has a 30 mph limit, whereas Mill Lane has 20 mph. 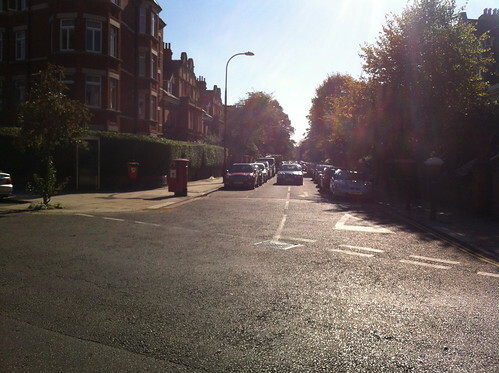 Mill Lane: this is a busy shopping street running between Fortune Green road and Shooters Hill. 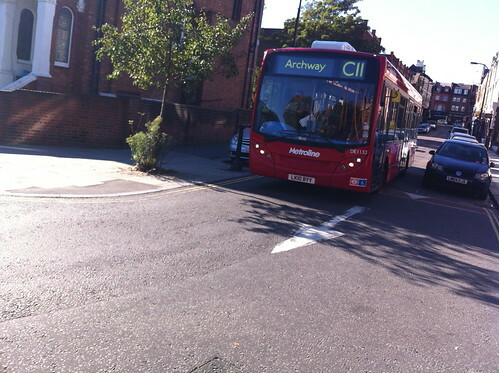 It has been subjected to various traffic calming and pedestrian improvements over the last five or six years. We have had concerns in the past over the widths of the gaps between kerbs and central islands on the zebra crossings (e.g. near to Solent Road). But we concluded that with the eventual reduction of speed to 20 mph, these gaps are no longer a hazard. Minster Road railway bridge: From Mill Lane we moved on to Minster Road and stopped to discuss the strange(cycle?) lane on the railway bridge between parked cars and railings (presumably it’s really a space to allow door opening – maybe the railings are intended to keep vehicles off the bridge side. 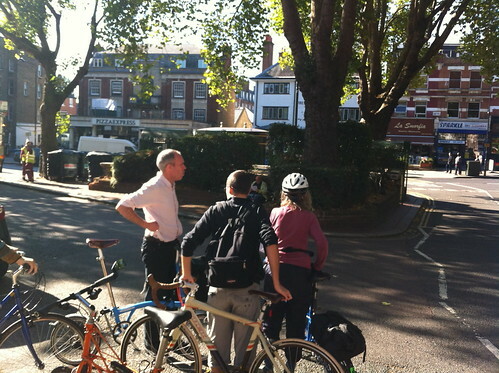 We recalled another similar one that we’d seen on the South Hampstead inspectionride (on Kilburn Priory). Cricklewood Lane: Turning north into Westbere Road, we continued on into Lichfield Lane, eventually reaching Crickewood Lane – the direction sign opposite indicated West Hampstead straight ahead (when it was really behind us) and Cricklewood to the right – both wrong! 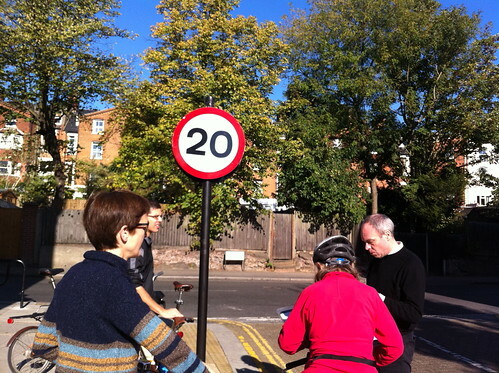 During this stop and our subsequent ride east along Cricklewood Lane (now in Barnet), we remarked on the change of atmosphere – faster traffic, few cycles, very different from Camden not far to the south. 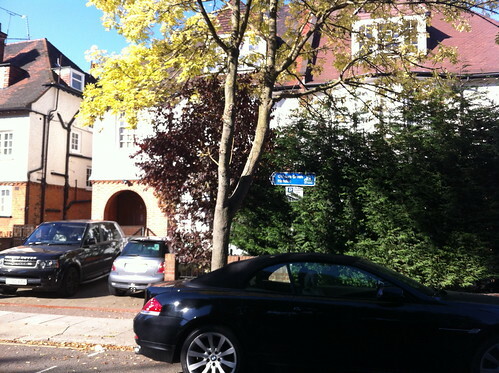 Route via Farm lane and Hampstead Cemetry: we turned right into the more peaceful, but rather suburban Farm Avenue. Meade led us via a pathway beside the Brondesbury Sports ground and Cricket club. This led to another path through hampstead cemetery, emerging and turning left in Fortune Green Road. Nasty crossing over Finchley Road: the crossing between Fortune Green Road and Platts Lane is very difficult for cyclists: its a long way across and while waiting to cross and move straight ahead, one can be hassled by turning vehicles such as buses. 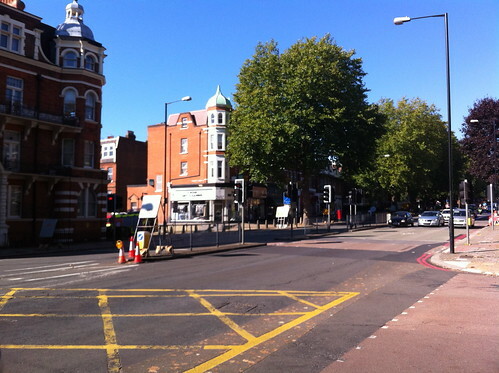 Good crossing over Finchley Road: The eastbound crossing from Lyncroft Gardens to Heath Drive provides well for cyclists with a central feeder lane and signal support to cross via elephants footprints into the southbound ASL box on Finchley Road. But we went straight across westbound into Cannon Hill (? ), then turned right into West End Lane. 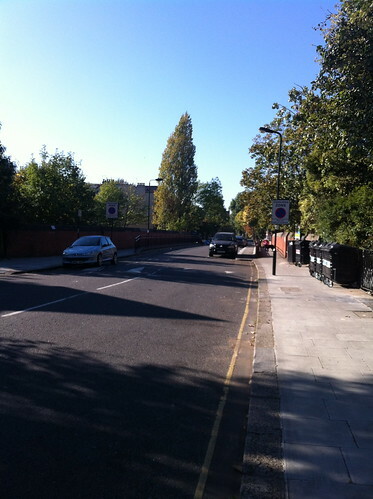 West End Lane triangle: this is the point where a right turn would lead towards Fortune Green road and Mill Lane. A left turn follows West End lane southbound towards our starting point. What were we discussing? Lunch stop: at a cafe on West End Lane.